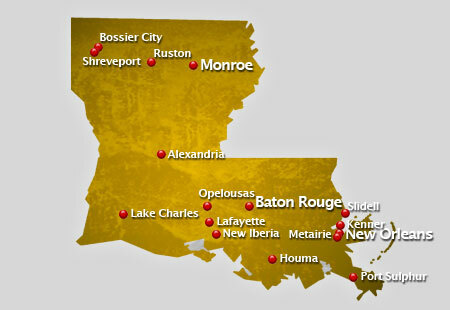 AirSign provides extensive aerial advertising coverage throughout all areas of Louisiana. From beach aerial advertising to sporting events and over busy highways, we'll display your message to crowds in a way your audience will be certain to remember. The state of Louisiana, historically, was named after the King of France, King Louis, after being claimed by France. It means -Land of Louis. Geographically, the state is divided into two: the the higher part of the state, the uplands, and the lower part of the state, the alluvial. The uplands consist of hills, prairies and woodlands, with a total area of more than 25,000 square miles. The alluvian, on the other hand, is a lowland part of the state consisting of low swamp lands and beaches. It has a total land area of 20,000.00 square miles. Like most of the states in America, Louisiana has a humid subtropical climate, with hot, humid summers, cool winters and significant rainfall every year. Some of the popular landmarks of the state are the Jackson Square in New Orleans with the statue of General Andrew Jackson at the center commemorating his leadership in the Battle of New Orleans, the Louisiana State Capitol with its towering architecture and considered as the tallest state capitol in the United States and the Old State Capitol, a gothic architectural masterpiece known to be 150 years old. The state of Louisiana has numerous public universities including Louisiana State University System, University of Louisiana System and Southern University System. Part of the educational institutions of the state are three religious seminaries; namely, the New Orleans Baptist Theological Seminary, Notre Dame Seminary and the Saint Joseph Seminary College. Though it is regarded as one of the least populated states, Louisiana is proud to have popular major sports league teams including the New Orleans Hornets of the National Basketball Association and the New Orleans Saints of the National Football League. Crowds are an aerial advertiser's paradise! A typical flight over popular events or locations can result in as many as 8,000,000 impressions! Have us fly your aerial banner over the crowds in Louisiana to put your message wherever you want, whenever you wish at the best value in mass marketing!